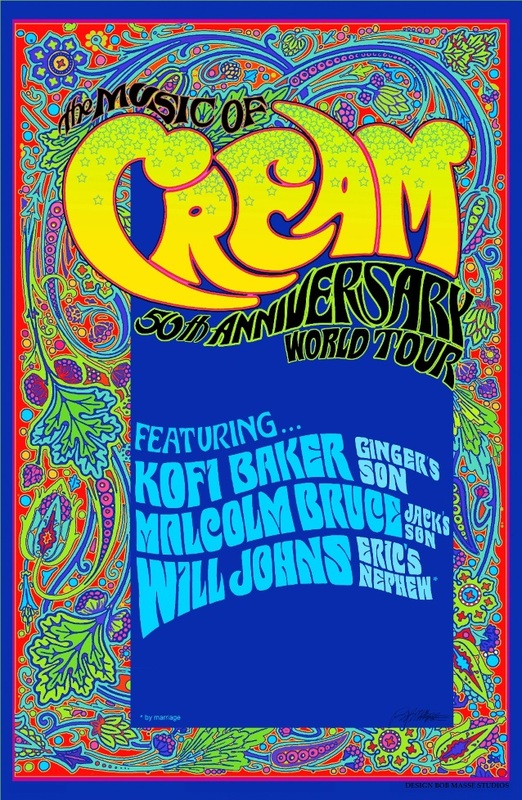 Following their successful inaugural tour across Australia and New Zealand in 2017, the pedigree of hallowed ’60s trio CREAM — Ginger Baker‘s son Kofi Baker, Jack Bruce‘s son Malcolm Bruce and Eric Clapton‘s nephew (by marriage) Will Johns — have come together for the first time in North America to pay homage to the band’s extraordinary legacy with “The Music Of Cream – 50th Anniversary World Tour”. The eight-week outing — kicking off September 28 in Ottawa and spanning 34 cities throughout North America this fall — will mark 50 years since the original lineup’s farewell U.S. tour of 1968. Having received rave reviews in Australia and New Zealand from the media and fans alike, “The Music Of Cream – 50th Anniversary World Tour” is primed to take over North America and celebrate the music and legacy their family members created. Prepare to hear personal stories and songs such as “Sunshine Of Your Love”, “Crossroads”, “Spoonful” and “White Room” performed across a comprehensive set, which will also see Baker (drums), Bruce (bass, vocals) and Johns (guitar, vocals) interplay with footage of their fathers and mentors on the big screen, along with never-before-seen footage and photos. This multi-media concert experience has been specially created for the 50th-anniversary tour, providing some of rock’s most memorable moments with a new lease on life. After the Ottawa launch, the first leg of “The Music Of Cream – 50th Anniversary World Tour” will travel throughout Eastern Canada and Eastern and Midwest USA stopping in such places as Montreal, Quebec City, Portland, New London, Englewood, Huntington, Philadelphia, Albany, Harrisburg, Baltimore, Pittsburgh, Cleveland, Indianapolis, Des Moines, Milwaukee, Madison and Louisville, among many others, before wrapping November 16 in Cincinnati. In addition, look for the announcement of four celebratory shows across the U.K. coming soon, coinciding with the anniversary of the original band’s legendary Albert Hall farewell concert, November 26, 1968, ahead of a nationwide tour in the spring. During its heartbreakingly short lifespan, CREAM was an explosive musical cocktail that provided the super-group blueprint for others to follow. The group’s third album, “Wheels Of Fire” (1968), was the world’s first platinum-selling double album, and collectively they sold more than 15 million copies of their albums worldwide. Not surprisingly, Rolling Stone ranked the Rock And Roll Hall Of Fame group (inducted in 1993) as 67th in their “100 Greatest Artists of All Time” list. Apart from an equally brief reunion in 2005 of seven shows at London’s Royal Albert Hall and New York’s Madison Square Garden, CREAM retained an almost mythological status in the music world, right up until the passing of Jack Bruce in 2014. This, for many fans, marked the end of an era and an acceptance that there would never really be another opportunity to celebrate the group’s legacy. That is, until “The Music Of Cream – 50th Anniversary World Tour” hit Australia and New Zealand last year.